NOTE: The program listing included here is only for those people interested in programming with GFA BASIC. In order for it to run properly, this program requires a picture file, which cannot be reproduced in listing form, in this magazine. The complete program is available on this month's disk or from the databases of the ST-LOG ST User's Group on DELPHI. In the game U-F-OTO (pronounced U-F Foto), you get to play the role of a freelance photographer trying to get work for a big-time newspaper. There are two things you need: a big event and opportunity. In this game you get both. The event is about as spectacular as they get: an invasion by a fleet of alien flying saucers, a la War of the Worlds. (Pretty original, huh?) Exclusive photos of this event would shoot any photographer (no pun intended) right to the top of the industry's charts. About three in the morning the phone rings. You flop over and pick up the receiver. It's Cinnamon, your girlfriend who lives in the adjacent apartment. There's panic in her voice. "UFOs," she screams, "Look out your window!" Here it is! Your big chance for a scoop photo! You fly out of bed, grab your 35mm camera (loaded with 18 frames of very fast film), pop on your flash (so maybe they will come real close) and run to the window, tripping over everything in the dark. You're amazed. It's perfect. They're all over the place, and here you are with a hot camera, ready to take pictures. Let's see now...the news photo lab closes at 4:00 a.m. What time is it now? Holy smoke, it's 3 a.m. Gotta work fast. And they have to be great shots. Double-click on the file PHOTO.PRG on your disk. 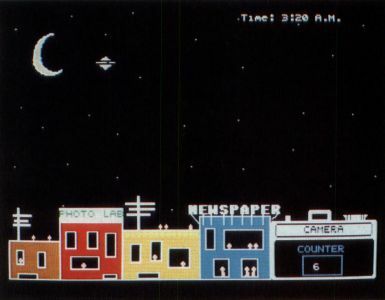 After the title screen, you will get a partial top view of the neighborhood. If you look closely, you will see some of your neighbors looking at the celestial spectacle. At the lower-right of the screen is your 35mm camera. It has a shutter release on the left, which is operated by pressing the left mouse button. In the center of the camera, at the top, is the simulated viewfinder. This is a single-lens reflex camera, so what you see is what you will get. The viewfinder is represented on the screen by a dotted cursor that flies around the screen area as you move the mouse. As with a real camera, this is where you frame your subject—you are going to be very busy trying to line up some of the saucers as they whiz by. After you align a space vehicle in your finder, click the left mouse button to take the picture. A flash will pop, and your picture will be captured on film. You will find the film advance on the top-right of the camera. This is used to advance to the next frame. After you take a picture, the cursor will change to a pointing finger. To go to the next frame, point the finger to the center of the film advance on the camera and click the right mouse button. The number in the film window on the back of the camera will advance by one. In case you forget to do this, the camera will start beeping. After a little practice, these movements will become second nature to you. Now this all sounds easy, and it would be simple to come up with some good photos of the saucers—if it were not for a few built-in difficulties of the game. First of all, there is the varying speed of the saucers; you never know how fast they will be traveling. Also, you cannot always tell when they will enter and where they will enter from. Even when you get a bead on one, it does not stay on a steady path. To further complicate matters, the saucers can sometimes detect that someone is watching them (and maybe even trying to photograph them), so they set up an unexpected shield, which makes them invisible. At times, this aggravating habit of theirs can ruin a great shot. Sometimes, after a certain number of passes, the saucers can detect that you are taking pictures. Since the inhabitants frown upon this, they have set their computers (Ataris, no doubt) and their infrared shutter-releases to activate any cocked shutters. So don't be surprised if your camera goes off accidentally, giving you a scare and a bad exposure. You should also keep conscious of your deadline. You have to finish the photo session by 4:00 a.m., or the newspaper won't even look at your photos until next time. And you know that there is no deader news than old news. So keep an eye on the clock in the upper right-hand portion of the screen. If it registers 4 a.m., forget it. The game will end. This clock, by the way, is ticking all the time—even while the film is waiting to be advanced, so don't dawdle. Sometimes it is difficult to overcome the time factor because you do want to get your best pictures for the paper, and the ships do not always cooperate with you. Are there any other problems? Yep. Let's say you get 16 photos to send to the newsroom photo lab. The paper must judge these as usable for the publication in terms of their quality and your dependability as a photographer. So they send them through a special scanner that examines them, pixel for pixel, and each is rated in points of quality and usability (don't bother to try and figure it out—these people are an esoteric group and won't like your prying into their business). In any event, your pictures will be displayed at the lab and the values will be revealed under each print as part of the final report. You might have a few good pictures, and you would think that would be enough to make the paper anxious to get you as a staff photographer. But this newspaper is very finicky. They accept only photos from photographers whose ratings (based on picture quality) are high. So you might have many good photos, but a low rating will get you rejected. If you clock below a 50 rating, you can forget fame and fortune. What can cause a low rating in your pictures? Several factors: 1) poor-quality photos, 2) slow reaction time, 3) bad exposures, 4) lens reflections and 5) flash-back. Miss the ship, getting a picture of space junk or buildings, etc., and you won't get many points. The amount of time you take to click the shutter is measured, and this amount is also deducted from your final score. Bad exposures (forced by the passing ships) won't get you any points. Fake ships can also dent your score, and if this doesn't frost you, nothing will. You might have what looks like a good picture of a saucer, but which is merely a reflection in your lens. 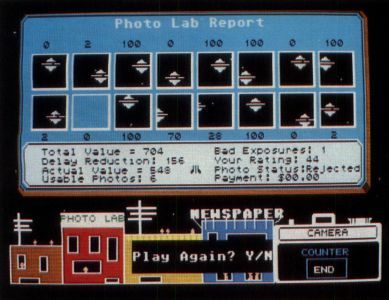 The scanners in the news photo room will detect a reflection and will give you no points for the picture (maybe a few for background objects), no matter how complete it seems to you. A quick eye and a fast finger will allow you to identify reflections and prevent capturing them. Hint: Look for ships with small dots on them—these are lens images trying to fool you. Your delay factor (subtracted from the total score). Your actual score (this is used by the news office to evaluate you). The number of usable photographs, if you are accepted. The number of bad exposures you got. Your payment for this job—if accepted. 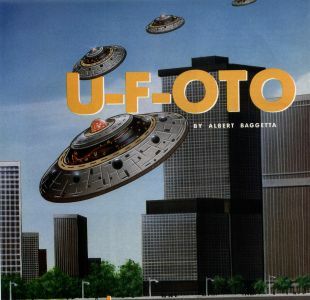 U-F-OTO is a game of strategy and pure luck that can be enjoyed by children of all ages. You can accumulate more photo points by waiting for the real ships, as opposed to the meager points you will get for anything else you capture. On the other hand, as you wait, those delay points are being deducted from your total point value. Delaying too long might also jeopardize any chance of getting a good picture because the alien ships might cause your camera to prematurely expose a frame of film. Because of these factors, the game is tantalizing enough to play over and over. After a while, it becomes a matter of pride to try to become a successful photographer. 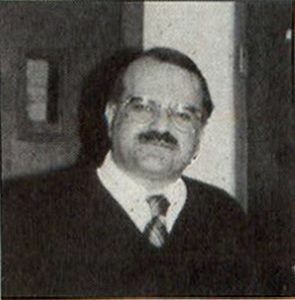 Albert Baggetta is an English teacher and a professional guitarist. He lives in Agawam, Massachusetts, with his wife, Beverly, and his two children. He frequently can be found wandering the ST-LOG SIG on DELPHI.